Also available for parties, same activities as clown. Katy BEE designed, rigged and performed a bungee act behind Enrique Iglesias for the NFL ProBowl in 2009. She can also be seen at Family Nights and other restaurant events. Michigan's premier five star entertainer! Singing telegrams, clown, all ages entertainment, you will love! She will help you create amazing memories for a lifetime. Let Katy BEE bring the party! She offers stage shows, a variety of characters, DJ service, musical activities, dancing, juggling, event shows, interactive entertainment, premier, high class, multi-cultural and multi-lingual, elegant experiences, corporate impromptu dance parties, and more! Katy BEE came through for me with my last minute "singing telegram" request! Two nights before my sister's 40th birthday, I had the wild idea to send a singing telegram. I did a quick search and found Katy Bee. I sent her a message on Instagram and heard back within minutes. The next morning we had a 30 min call to discuss logistics and details. She put time and effort into her outfit, the sound choice, and picking up flowers, balloon, and card to hand deliver to my sister. My sister is a high school Spanish teacher and Katy BEE is bilingual, so it was perfect! She sang in English and Spanish and danced and got the classroom involved. All done very last minute for a reasonable price. The whole school talked about it all day! Thank you Katy! Wonderful mime! Great experience with KatyBee! Loved our time with KatyBee! 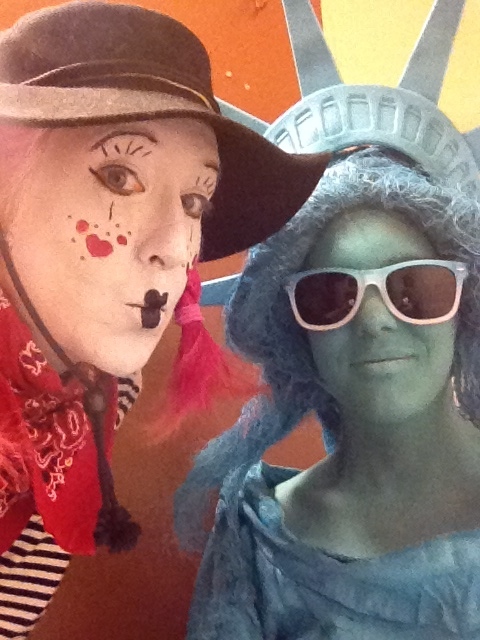 In addition to being a terrific mime and a great entertainer, she has a fabulous rapport with kids. Kids enjoyed her with rapt attention! KatyBee was also very professional, timely, and courteous. Highly recommend. Kids and adults all loved the show. There was dancing, singing, juggling, balloon twisting. As a mother of three and a preschool teacher I loved the way Katy Bee changed the activities to keep the kids entertained, interested, focused and have fun.Thank you so much for the great time! Thank you so much Olena! It was a pleasure to meet you! Katy did a fabulous job! Thank you very much, Randy it was a pleasure working with you! Katy Bee was fantastic! Not only is she extremely responsive and on top of things, but she is also collaborative! I was so impressed and thrilled with the Whole experience. I highly recommend her!! Katy Bee performed a singing telegram for my mom on Mother's Day, and I was blown away by the amount of research and effort she invested in her performance. She contacted me in advance to find songs that were meaningful to my mom, determine which of her many characters she should dress as, and have me write a note for her to present along with flowers and a balloon the day of. I didn't know what to expect when I made this order and I was impressed by how professional and thoughtful she was. Mom loved it. Highly recommend! Katy was very professional, and made the entire process extremely easy!! Thank you. It was a pleasure working with you! Very prompt and professional with communication. Gave an excellent surprise singing/dancing birthday telegram! Highly recommend! Thank you so much for your generous review! She's amazing! The kids LOVED! Thank you for making my daughter's birthday so fun! I hired Katy BEE for my daughter's first birthday/Baptism celebration. She was flexible, easy to work with, and the kids had a blast. It was a 4 hour event for about 75 guests (including 15 or so kids), with a buffet. She started off with face-painting (which was excellent), then did her show which included interactivity for the kids, juggling, hula-hoop and then an interactive dance party (to help the kids burn off all the sugar). She then ended with the "tattoos" which the adults loved as much as the kids. She kept busy even while we cut the cake and Doljangi by also doing balloon twisted. She had her own speaker which was incredibly useful since our venue did not have one. It even had lights on it, which the kids loved. I think the adults (even the ones that didn't have kids) enjoyed watching the show, especially when she got the kids to act silly. The kids ranged in ages 1 (my daughter) to 6, and they ALL got involved, even the shy ones. I cannot recommend her enough. I work at a Senior Day Care Center For Senior Citizens With Disabilities, Katy went above and beyond her Performance was Amazing had all the Seniors engaged Katy involved the seniors in her performance . The performance was a big hit the seniors Loved it Katy was extremely friendly treated everyone with dignity and respect. Provided dancing , juggling and Hula hooping and many more, had everyone dancing to the music and lots of laughter. Most importantly put a big smile in all of our Seniors Faces .I highly recommend her for any event Thanks Katy you're the Best! To begin, we loved Katy's clown look. It was very disarming for that of a clown, which some little ones tend to be afraid of. Her look was cheerful and happy-- as was she! 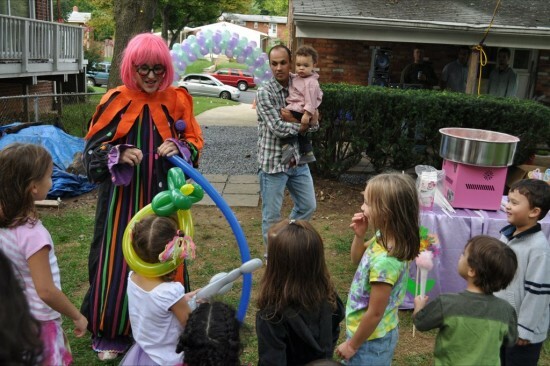 She stepped right in to engaging and entertaining our guests and their children. She did face painting, balloon twisting and hula hooping to name a few! We will definitely use her services again as she was such a pleasure to all! Thank you so much Heather! It was a pleasure working with you! I hired KatyBEE as a singing telegram for my boyfriend's birthday. She was very quick about responding to my request, first of all. I was a bit unsure about what to do creatively, and she had ideas (and song choices!) galore after I told her his personality. She even sent me pictures before and after, since it happened at his job during work hours and couldn't be there. She thought of every little thing - even getting flowers and a card! Definitely worth every penny. Thank you for an experience that we (and his coworkers haha) will remember forever! Thank you DeAnna!!!!! :) It was a pleasure working with you! I needed a singing telegram for my brother's 30th birthday and she NAILED IT! I live out of town so entrusted her to assemble a hilarious, custom song and delivery to make the birthday celebration. She was in constant communication, worked through several revisions, assembled a custom costume and delivered an unbelievable performance! It is WELL WORTH the investment - do it!! You won't be disappointed! I hired Katie Bee for my goddaughter’s first birthday. It was the best part of the party. 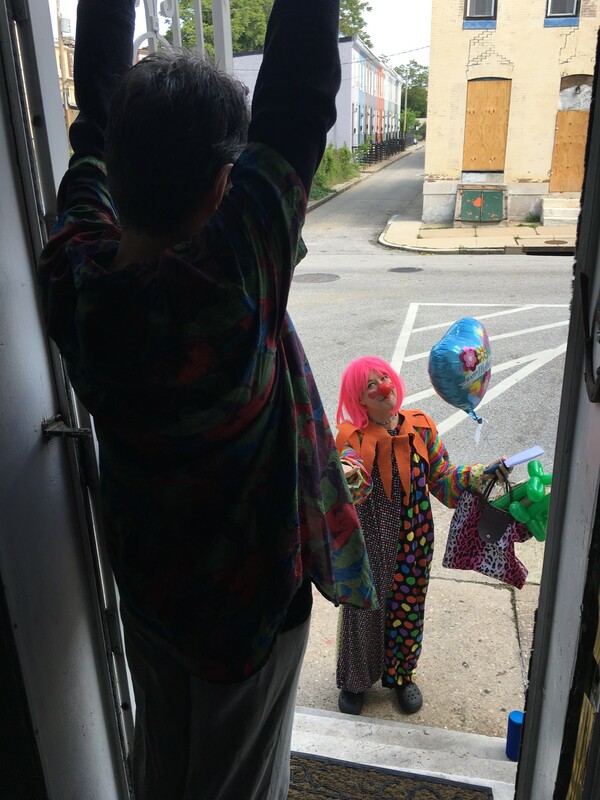 The moment she entered, magic began –- from her costume to the way she personally introduced herself to each child present. She is sensitive to kids who are a little intimidated –-- knows how to get them to warm up to her. What sets Katie Bee apart from her competition is the fact that her complete all-in-one, personalized package includes: DJ (plays a wide variety of genres and styles of child-appropriate music), Balloon artist (children had many exciting choices), face painter (beautiful designs as well as accommodated children’s requests) Entertainer –- juggling, tricks, etc. Her pacing is impeccable and having her there took away the stress of having to keep the children engaged. Punctual, easy to communicate with – Katie is a “must have” for any engagement. Thank you so much Vanessa, it was a pleasure to work with you! Kids had lot of fun! Thanks Katy for making my daughters birthday fun and memorable. Katy has amazing talent to engage multiple age group kids and she did her job with lot of patience and grace. Thanks Katy! Thank you for your glowing review. I had a lot of fun!! Katy Bee did a great job!!! Everybody enjoys it! She entertains kids very well. Especially the story time. Originally we are from Russia, so she found some Russian songs and that was very nice!!! I recommend everybody Kate Bee, you won't regret!!! My pleasure :) It is always an honor to be invited to help celebrate special moments! Bee Bee is the BEST thing that happened to my party. Bee Bee come to my two sons (1st, 6th) party and rocked the house! There was games, face painting and a whole lost of FUN!!! She kept all 13 kids happy and entertained. They are already asking when is Bee Bee coming back. Thank you Catherine! I had a great time! Kate is Awesome!! From start to finish she was great to work with. She is so professional, has great follow up and is super organized!! She made everything so easy!! Kate showed up 15 minutes and had everything ready to go before anyone arrived. The party was a blast!!! She never stopped moving for a second. Entry dance to balloon twisting, to group dancing/ singing, learning to count in different languages, picking animals and imitating them, juggling, and the best face painting!!! OMG, did I say she’s awesome!! Really best birthday ever!!! More then I hoped!! Brilliant!!! Thank you soooooo much!!! Will be in touch again and recommend you to everyone!!! Shelly, you and your friends and family were also energetic and super fun!! Thank you so much! Katy Bee provided the most awesome entertainment at my daughter's 1st birthday party. She was able entertainment children from ages 1-12 and all had a great time. Very professional, quick responses and overall awesome. Thank you Keisha! I really enjoyed it! Katie is charming, conscious, caring, and FUN!!!!!!! I could not have asked for a better clown & person to be at my son's birthday. Everyone loved her and her assistant clowns. They were all just lovely. If you get the chance to book Katie, DO IT. You will not be disappointed. Thanks for coming all the way to Miami, Katie!! Kate was absolutely the best! She was great with kids and adults alike. Great personality. Always fun and energetic! Do your event a favor and hire Kate today! Thank you so much for the opportunity and the review! :) I had a blast with you all! Thanks Again! Kate is a fantastic performer and very professional! 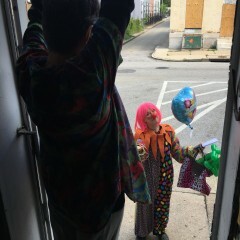 She entertained a small group of kids of varying ages for my son's 3rd birthday as her clown character and did such a good job...all adults and kids were entertained and the birthday boy felt very special. She does a great job of reading people's personalities to adapt her character for the most happiness and fun! We liked her so much that she also entertained a large group as the Ninja character for my older son's birthday party and the group loved it and we enjoyed the funny Kung Fu performance. Her balloon twisting and face painting, glitter painting is a huge hit with all the kids...boys and girls, young and old! She even speaks different languages and taught the kids some fun words. Everyone was very entertained. Thank you Bee Bee! This family was a pleasure to work for. Thank you so much! My dad recently celebrated his 86th birthday with help from BeeBee!! He and my mom were a bit down about recently moving into a senior living home, I live across the country from them and was looking for the perfect birthday gift... BeeBee surprised my dad at a meal with other residents with fun 20's music, songs, and balloons animals for all the residents, who had a great time! I heard that the nursing home staff were dancing around the cafeteria. BeeBee was an unforgettable gift for my dad, and he looks forward to seeing BeeBee again. It was an honor to be part of such an important birthday. Best part of the birthday party. Captivated the kids and impressed the adults. Lots of great entertainment including Kung Fu, face painting, balloon twisting, interactions, etc. We got it all in one! I think Bee Bee the clown did I nice job of entertaining 20 kids at my 7 year olds birthday party. I would suggest that even though Katy Bee was fabulous she might want to think of some ways to keep the kids attention. That being said my kids had a good time. 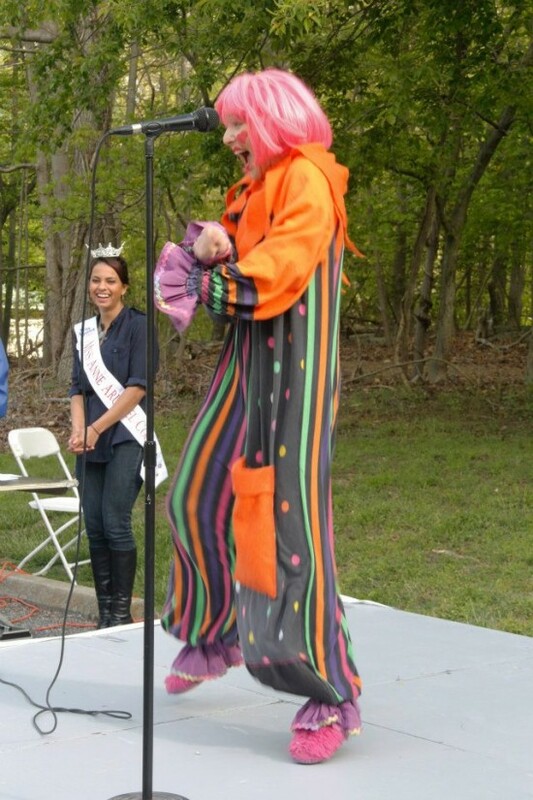 Review by Carolyn A. S.
Katy Bee was a terrific clown at our 2011 Kidney Walk. We had nearly 300 people in attendance and many were young children who were thrilled with Katy's antics and balloon animals. She entertains adults as well as children and was flexible as the weather went from sunshine to storm clouds. I highly recommend her for big and smal groups. Insurance: $3 million - Basic circus coverage for aerial, juggling, and fire performing. It will be fun and exciting, creative, warm and friendly. BEE BEE the Clown will arrive, and excite the party. She will get everyone involved and participating in your child's celebration with activities and energetic fun. Usually the clown experience start with balloon animals. After everyone has what they want the music begins to pick up and the dancing and musical activities start. The dancing will continue for as long as the kids want to (or as long as time allows) and then will quiet down with face painting, tattoos, or a story. Considering all of her experience, BEE BEE Clown offers a great party atmosphere with exercise, fun, and a reasonable price. You can read about Kate McGlynn's background here, (creator of BEE BEE Clown, the Aerial Action Team, The Clumsy Ninja, Warrior Girl (circa 1993), and more).
" As a performer, I have been trained in many circus arts, including aerial acrobatics, fire dancing, juggling, trampoline, acrobalance, theatrical makeup, mime and traditional clown. I also have been trained in, and taught laughter yoga, martial arts, rock climbing, hand balancing, and more. I went to the Rogelio Rivel Circus school in Barcelona, Spain, and worked with children there as well as in the USA. At the Volatin circus school in Spain, I studied bungee acrobatics and rigging, vertical dance, and a little bit of flying trapeze. I started performing on stage in 1993. I co-founded troupes like the Aerial Action Team, The Society of Superheroes, and the Artists Collaborative Coalition in San Francisco and since then have worked with such groups as: the NFL and NBC at the Hawaii Pro-Bowl in 2009, HBO, have been interviewed by MTV, and performed for Ken Kesey, The Black Rock Arts Festival, Cirque du Soleil, and Grotest Maru. I have traveled throughout the world performing for international audiences. I am fluent in Spanish and English, and can create original performances involving any language that may be of interest." Kate McGlynn has also worked as a life coach in Los Angeles, Barcelona, and Detroit. She also toured Europe and Mexico with Cirque du Soleil as an electrician during a time when she was unable to perform. WITHOUT package pricing, you have access to ALL of the services that I offer and EXCELLENT customer service. I also act as a DJ and bring my own speaker for your event. BEE BEE Clown can be seen at Bat Mitzvahs, Bar Mitzvahs, Weddings, Birthday Parties, Quinceneras, Singing Telegrams, Festivals, On stage and off stage, Reunions, Apartment events, Appreciation events, Circus events, Community Events, Recreation Centers, and Community Centers. If you need to see more reviews, please look at http://www.gigmasters.com/clown/BEEBEEClown/ where I also have a five-star rating and more recent reviews. I am available week days as well as weekends. I can offer specialized activities for schools, day cares, and special events as well as birthdays. European Circus, Cirque du Soleil, Moshe Cohen, and more.